Please check the Vehicle Application List to determine which PedalBox is compatible with your vehicle. With the new multi-protocol technology, the PedalBox+ is also available for digital accelerator technology with modern SENT technology. 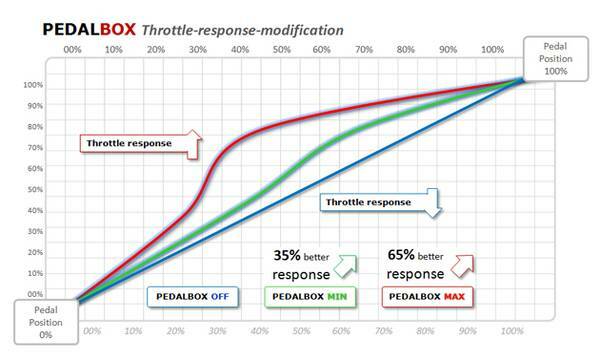 For a perfect tuning result, the PedalBox+ can be automatically customized to each individual vehicle. With PerfecTune, all programs will fit ideally to your vehicle. With a more accurate and faster signal transmission, the latest high-performance microprocessors ensure an optimal tuning result. Bought this for my 2006 BMW 325xi. I was experiencing a lot of throttle lag when accelerating from a stop. This helps to reduce the lag significantly although not completely.